When are prices going to return to the super cycle era levels? When are cash rents and land values going to succumb to economic pressures? These are questions that I frequently encounter on the road while speaking to agricultural lenders, agribusiness producers, and academic peers. The past six years of net farm income levels are now the new normal. Let’s dig deeper into these questions by examining median net farm income reported by the University of Minnesota through the FINBIN database from 1996 to 2017. 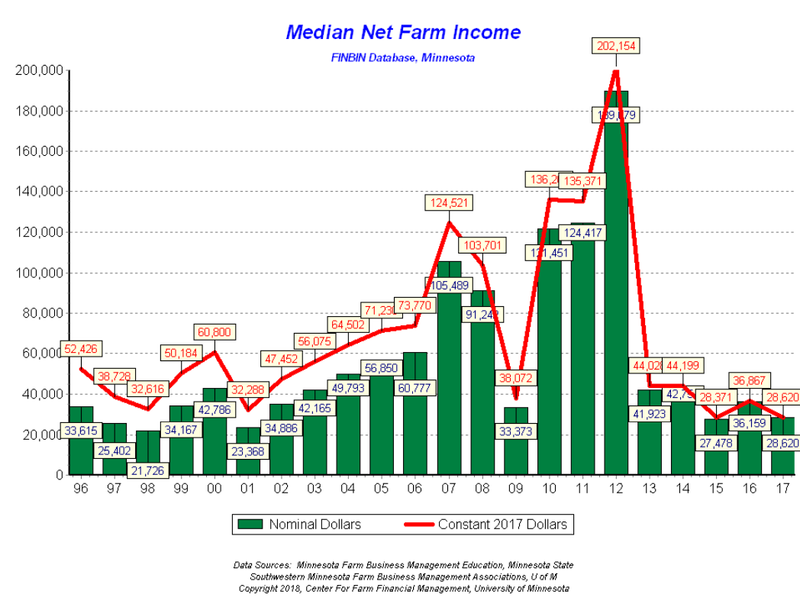 Median net farm income represents the middle point of a data set. Analysis of five years of net farm income data from 2013 to 2017 produces interesting results. During this time, median net farm income was approximately 50 percent less than during the super cycle from 2007 to 2012. Inflation adjusted dollars were used in this comparison. In most recent years, median net farm income on accrual adjusted data has been in the low to mid $30,000 range. During the super cycle, net farm income was in the mid $80,000 range and spiked to nearly $200,000 in both constant and nominal dollars in 2012. Which era is the median net farm income of recent years most similar to? One may guess that it would compare to the five year period from 2002 to 2006, just prior to the super cycle. However, this period finds constant dollar median net farm income in the high $50,000 to low $60,000 range. The period of time that the economic returns of recent years is most similar to is from 1997 to 2001. During this period of time, average median net farm income was $43,000 in constant dollars and $29,000 in nominal dollars. The point of this analysis is that profit expectations will need to be shifted for the median producer to levels not seen since the last century. Yes, a weather rally or some other black swan event could cause prices to spike temporarily. However, for the long run the new normal may look, feel, and smell a lot like the period before the super cycle, but it actually compares more closely to the late 1990s. High prices cure high prices: The commodity economic super cycle brought higher variable and fixed costs. Higher costs resulted in lower and negative margins to those renting land first, then eventually those with land ownership. Low prices cure low prices: Lower commodity prices will force producers to focus on reducing fixed costs first and, to some extent, variable costs. A word of caution: The net farm income data is showing a gap developing between the top third and bottom third of producers. The top third of producers are still making money, but the bottom third is starting to fall behind. This changes the economic decision making for each and every producer based upon their ability to manage through these tough economic times.